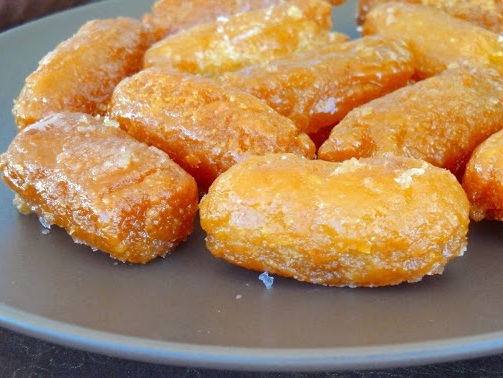 Kakinada Khaja: Kakinada Khaja is a sweet delicacy of Andhra Pradesh, India. Kakinada, a coastal city in Andhra Pradesh, is popular for Khajas, hence the name. Kakinada Khaja is just a replica of Ranchi Khaja. Khajas were brought into Andhra by Muslims, probably at the time of the Nizams. The two well-known types of Khajas are madatha khajas and kakinada khajas. Kakinada Khajas are dry from the outside and juicy and full of sugar syrup on the inside. Place the all purpose flour in the flat wide plate. Make a hole in the centre of the all purpose flour. Mix the gram flour with the all purpose flour. Add in the 1 teaspoon ghee to the flour mixture. Knead soft pliable dough, by adding water, little at a time. Rest the dough, by covering the dough with damp/wet cloth, for 1 hour. Take the sugar in the pan and add 1 cup water until the sugar dissolves. Boil the sugar syrup for 5 minutes. Remove the cloth from the dough. Shape the dough like a long and thin log. Cut the dough into 1 inch by 1 inch squares. Take each cube and roll it again to 1 inch by 3 inch rectangles. Heat the oil, for deep frying, in a deep fryer or work to 150°C. Slowly drop the kakinada khaja’s, a few at a time. Fry the kakinada khaja’s until they turn to golden brown. Drain from the oil and transfer them to the sugar syrup. Let the kakinada khaja’s sit in the sugar syrup for about 20 minutes. Remove the kakinada khaja’s from the sugar syrup. Kakinada khaja’s are ready to be served. If you have any queries regarding the Kakinada Khaja recipe, please leave a comment.